Plan will establish the park as an international benchmark for environmental and economic sustainability. Officials from the Gulf State Park Enhancement Project today unveiled a multi-year master plan that will help the park achieve its vision to become an international benchmark of economic and environmental sustainability. The reveal marks the end of a yearlong process, during which the Master Plan Team gathered feedback and input from three community open houses, over 2,600 online survey respondents, community leaders, environmental groups and stakeholders. The master plan includes three phases, each with multiple elements. Phase one focuses on the five elements supported through Early Restoration funding from the Natural Resource Damage Assessment Process (NRDA). This phase ensures the proposed trail and visitor enhancements, Learning Campus, Interpretive Center, Dune Restoration, and re-building of the state-owned Lodge are incorporated within the Park’s existing conditions. Phase two identifies additional opportunities to further strengthen the economic potential of the park, including additional trail enhancements, campground improvements, golf course conversion and implementing a park tram. Phase three suggests long-term enhancements to trails, picnic area and additional overnight accommodations to further add to the visitor experience. The plan – along with phase one of the projects outlined above – were funded as part of an $85.5 million early restoration settlement from BP to compensate for lost revenue to the park during the Deepwater Horizon oil spill. The Gulf State Park Enhancement Project will provide ecologically sensitive enhancement to the 6,150-acre park located in Baldwin County, Alabama. This stretch of coastline runs from Gulf Shores to Orange Beach, and is operated by the Alabama Department of Conservation and Natural Resources. 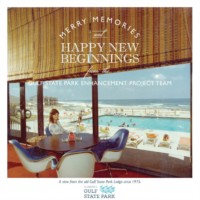 The Gulf State Park Enhancement Project consists of enhancing the visitor experience, restoring the dunes, building an environmental information center, creating a learning campus and rebuilding the lodge, among other visitor benefits. The Gulf State Park Enhancement Project is being executed by the State of Alabama and the State of Alabama Department of Conservation and Natural Resources by and through its agent the University of Alabama’s Gulf State Park Project, a project of the University of Alabama Board of Trustees. Sasaki Associates created this master plan in collaboration with Watershed, Thompson Engineering, Volkert, Inc., Barry A. Vittor and Associates, Biohabitats, and Spackman Mossop and Michaels.